While its simple to make the mushroom filling, serving anything in a puff pastry can be rather elegant. If rolled out pastry is not available to you, its simple to roll it out from a block. Make sure its old to touch, that the room is not too hot when you are working, and use a little flour both on the surface and the rolling pin. Roll it out on the parchment paper so you can lift it up and place on the tray without a chance to break it. Alternately use vol au vents, party shells, filo cups etc. 300 gms of cream cheese, preferably garlic and herbed flavour. Melt and heat the butter and olive oil. Add the chopped leeks. Saute until soft and add the mixed mushrooms, the thyme, port and a pinch of salt. Cover and cook well for about 20 minutes. Give it a stir, remove the cover and allow all the liquid to evaporate. Cool completely. Add the cream cheese and mix it in with a spoon. Divide it in half and fill the rolled out puff pastry sheets. Fold in the sides, bring the bottom to fold up and bring down the top to fold over the bottom. Turn it over, on a baking sheet on a butter paper; ensuring the seam is down. Apply an eggwash, or milk/cream wash.
Make two slits on each roll. Bake on 400F preheated for 30 minutes until crisp and golden brown. If your cream cheese is plain, add two tsps of fresh herbs that are finely chopped and one crushed clove of garlic. Slicing the cooked pastry with a pizza cutter is the simplest. Keep the creamcheese at room temperature to help it mix easily. If the mushroom mixture is not fairly stiff refrigerate it for 30 minutes. The mixture will melt and ooze out if it is runny or too thin. Always thaw puff pastry in the refrigerator overnight. It should be cold to touch when you are working with the pastry. Ready to use rolled out pastry is available in many stores. 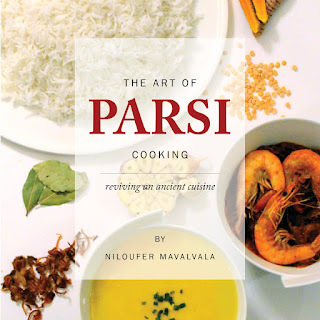 For Parsi Food and recipes click on The Art of Parsi Cooking; reviving an ancient cuisine.